I’m not a dog person. I prefer cats. 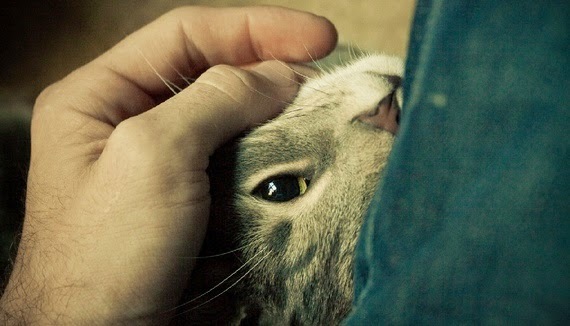 Cats make you work to have a relationship with them, and I like that. But I have adopted several dogs, caving in to pressure from my kids. The first was Teddy, a rottweiler-chow mix whose bushy hair was cut into a lion mane. Kids loved him, and he grew on me, too. Teddy was probably ten years when we adopted him. Five years later he had multiple organs failing and it was time to put him to sleep. When I arrived at the vet, he said I could drop him off. I was aghast. No. I needed to stay with Teddy. As the vet prepped the syringe to put him to sleep, I started sobbing. The vet gave me a couple minutes to collect myself and say goodbye. I held Teddy's paw until he died. Honestly, I didn't think I was that attached. This experience led me to undertake experiments on animal-human relations to try to understand how animals make us care so much about them. Biologically, I wanted to know if pets cause the people to release oxytocin, known as the neurochemical of love, and traditionally associated with the nurturing of one's offspring.